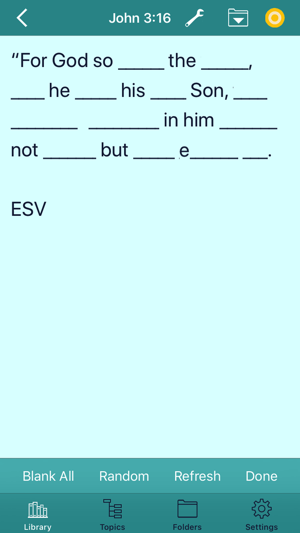 The primary purpose of this application is to give you tools to help with scripture memorization. The current version has a word removal tool, flashcard tool, audio record & playback functions, custom folders, search function and the ability to add your own verses. The secondary purpose is to provide organization tools of verses to help you find verses to memorize, study, share, or just to discover what the Bible has to say about particular topics. 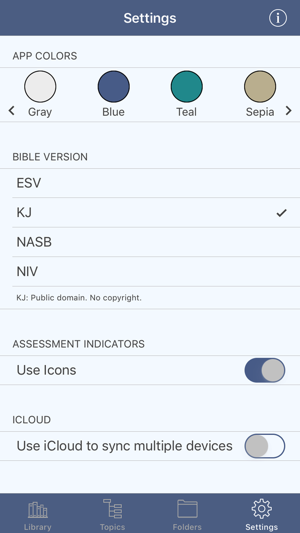 Verses can be reviewed in Bible order, by Topic, or by verse rank( 1 - 200). - Improvements to the audio playback for continious looping of single verses and random order for recorded folder. - First pass on very basic color schemes. 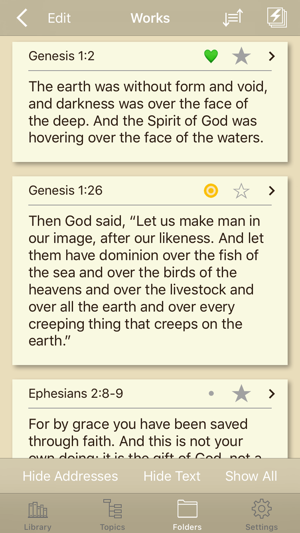 This app is great for memorizing scripture. I love the part where you read the verse and fill in the blanks and more blanks appear until you find you have memorized the whole thing. It has MANY good features such as being able to record the verse. I used it all the time until it was updated and the beautiful image of following Christ up the stairs to enter the site was discontinued and the verses I had memorized were no longer in my memorized folder. If that image was restored I would probably use it again, even though I would have to go back and add all the verses I had memorized. Without it, the app seems unfinished and somehow loses its appeal. There is a feature where you can restore your old files, but I think I may have downloaded the app twice looking for that image I liked, and then lost them. No one else should have that problem. I have had so much fun memorizing my favorite Bible verses these past few days! 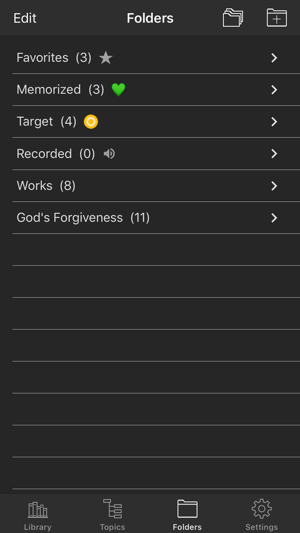 This is a well designed, carefully thought out Scripture Memorization app! I downloaded this app 2 days ago, and it is rapidly becoming one of my favorites! 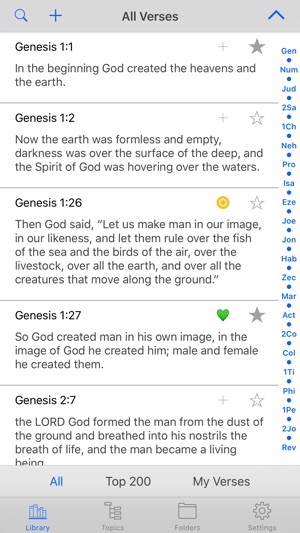 The features that allow the user to cut and paste verses from their favorite Bible Version, create verse categories, arrange the categories in a chosen order, and then arrange the verses in each category into Biblical order, or any order they prefer are very easy to navigate. I especially like the Word Removal practice tool, in that it offers choices to eliminate just the words with either 1 letter, or 2 letters, or 3 letters, for levels of increasing difficulty. The added feature of being able to tap each “missing word line” one word at a time to reveal that word makes it a great memorization tool. Also, the iCloud backup for automatically transferring all my verses to my other devices is another plus. I’m in the process of cleaning off an older iPad and transferring files. I had version 2.5.0 installed there and had not used it for quite some time (not sure why — I kind of got away from memorization in general, I guess). When it came time to decide whether or not to try to salvage my verses, I assumed that since it was so old, it had been removed from the App Store. I was excited to see it’s still available and appears to be better than ever. Looking forward to using it.